Can you believe it's time for ANOTHER birthday? Not only that, but I can not believe my first born is going to be 4 ... THAT is crazy!! Our theme this year is a PIZZA PARTY!! 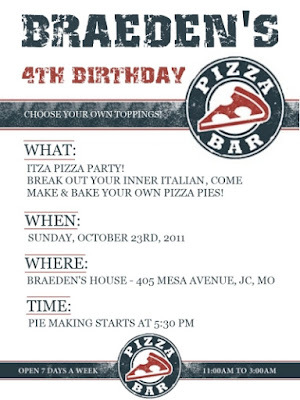 Breaden loves pizza, and I thought it would be a fun get together with family. Everyone is going to be able to make their own personal pies and enjoy a pizzeria atmosphere. Can't wait to share all the little details with you :) Let me know what you think! Hey! Just FYI, your address is visible on the invitation.